This is the last new episode of the year with BBQ Ptimasters returning 1/7/10! Cooking skills, nerves and patience are tested at the historic Riverfest Barbecue Cookoff in Decatur, AL as the Pitmasters battle for the $3,000 top prize. Paul tries to avoid last place placement, Lee Ann’s schedule is threatened by a power outage and Tuff Stone uses spreadsheets for BBQ?!? All the seven teams in the TLC TV shoot were invited to dinner at Chris Lily’s Big Bob Gibson flagship restaurant in downtown Decatur. We were all expecting a BBQ meal and boy were we surprised. Chris, who is the consummate Southern gentlemen with charm oozing from every pore, totally blew us away with the menu he personally created and cooked for us. Amid the whirring of many TV cameras and fuzzy boom microphones in our faces, we were treated to appetizers of seared giant scallops wrapped in BBQ brisket, and shrimp with basil mousse wrapped in bacon with BBQ sauce. This was followed by a delicious BBQ gumbo slow simmered with a dark roux for many hours topped with crispy fried okra dusted in cornmeal. The texture of the fried okra contrasted beautifully with the rich gumbo which was served over steamed white rice. Main course was a cranberry Caesar salad with Balsamic vinaigrette served with a perfectly grilled tender rack of lamb paired with the signature Big Bob Gibson BBQ chicken with the white BBQ sauce. Hey, don’t knock white BBQ sauce if you haven’t tried it. It was mayonnaise based and it worked well with the flavors of the BBQ chicken. Everyone was stuffed by the last course but we had to leave room for dessert because Chris brought out four of his favorite pies: lemon, peanut butter, chocolate, and coconut. I tried a piece of everything and it was heavenly! After a good night’s rest at the hotel, we showed up at the contest site around 11 am. All 7 pitmasters were tucked away in the corner of the parking lot while the rest of the teams (about 60) were on the grass. It was good to be on asphalt as it rained so it was muddy and boggy for the teams on grass. The cook went normally with the exception that we lost power at night. We helped Lee Ann out as her rotisserie smoker does not run without power. Luckily, the power came back after an hour or so. We were not affected because with our trusty battery inverter power supply, we can cook without reliance on generator power. 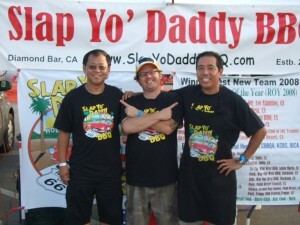 I want to give to shoutout to Steve Blake and Bob Fite of the local Piggy Jiggy BBQ team. These guys were fantastic as they purchased our contest ribs and chicken for us so we didn’t need to lug it from Los Angeles. I cooked the California influenced recipes again we finished 15th of 60 teams. Not too bad as we beat 45 good teams. 15th chicken, 17th brisket, 28th ribs, and 30th pork. 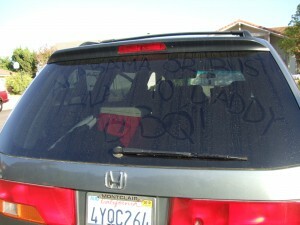 Mark and I flew back to LA on Sunday and our terrific Roadie Gary drove our van to the next contest location. I want to thank and express gratitude to Gary Notley for being our third team member. Gary was our arch nemesis in our 2008 Rookie year and we traded first places throughout the contest year before we finally cinched the ROY title in December 2008. 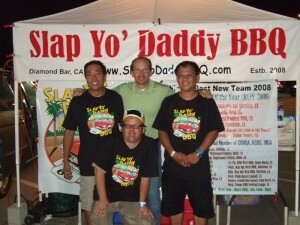 We had become BBQ brothers in the process and it was awesome that Gary could join our team and be in the show.